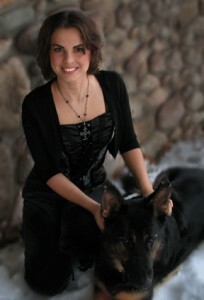 Raven and Lain Bower are a wife and husband team of writers. They are avid role-players and love to design mythical and diabolical creatures, characters and fantastic worlds together. They live in Northern Michigan with their four kids, hellhounds, alien doom cats and the ever growing tentacle army. In their *cough* spare time *cough* they enjoy gardening, home improvement projects, archery and target shooting. Raven is an aquarist – obsessed with creating mini-ecosystems encased in glass (read natural aquascapes in fish tanks) and raises assorted freshwater fish, shrimp and plants. Lain is an accomplished technician who upgrades and repairs audio equipment, mostly Carver amplifiers, and various electronic devices. The adventure fantasy novella, Nymph’s Lair. The film rights for the Apparitions series have been purchased by Joseph Leroy Studios, LLC. Directed by Michael Bryant. Screenplay by Raven & Lain Bower.